Today is Mickey Mouse's 90th Birthday and what better way to celebrate than with a Mickey Mouse themed giveaway! 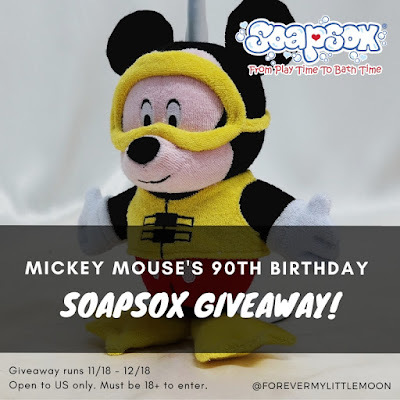 1 Winner will win a Mickey-themed Disney SoapSox! 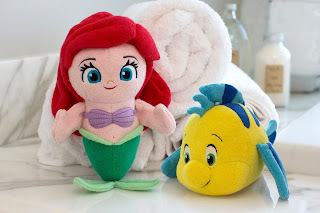 The new SoapSox® Disney Baby line of bath toys feature some of Disney’s most beloved characters including Mickey Mouse, Minnie Mouse, Ariel and Flounder from The Little Mermaid, as well as, Nemo and Squirt from Finding Nemo. SoapSox® drenched the bath toy market in 2013 when it introduced its lovable 2-in-1 stuffed animal washcloths. 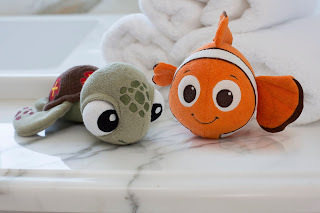 Now kids can cuddle their favorite stuffed Disney Baby companions during the day and then play with them during bath time for added fun in the tub. Snuggle, cuddle, and play together all day and when it’s time for your bath, bring them with you! A patented soap pocket transforms lovable SoapSox® into sudsy washcloth – just add soap and scrub. 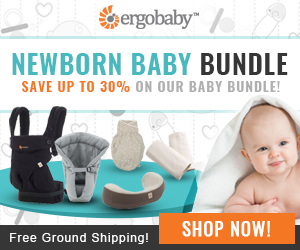 You can find them at BuyBuyBaby or at SoapSox! Terms and conditions located in giveaway form. I would give this adorable Mickey Mouse SoapSox to my adorable Mickey Mouse fan GreysonBlu. He loves his tubbies and this would just make his day being able to take a bath with his favorite Disney character!!! What a cute idea! 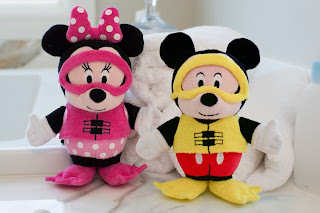 My kids loved bath time when they were younger, and they would have loved these! This would be a great holiday gift. I'd give it to my almost 3 year old grandson. 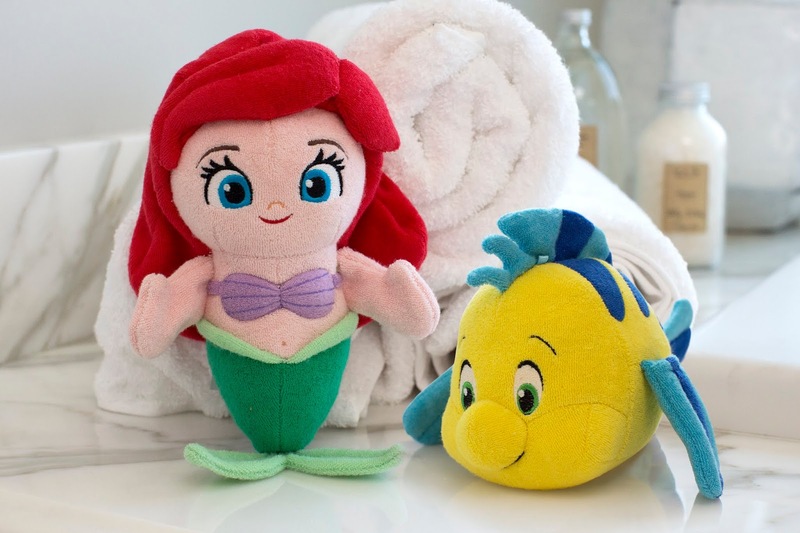 He just discovered all of the wonderful Disney characters and would love this at bath time! Thanks for the chance. My dear friend is getting a new grandson for Christmas! His anticipated arrival is 12/24. Will I be the best "auntie" in the world? 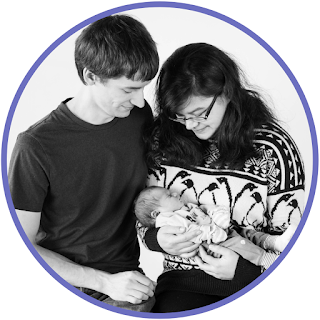 My daughter was born on Christmas eve! She was supposed to be a New Years baby, but came early. My little guy would absolutely flip for this! My niece is a GIGANTIC Disney fan, and with a new little one, this box looks amazing! I would love to win this for my son, Charlie. I would give this to my son Jack.